SPPI’s authoritative Monthly CO2 Report for May 2009 reveals that more than 700 scientists from 400 institutions in 40 countries have contributed to peer-reviewed papers providing evidence that the Medieval Warm Period, which the IPCC has tried to deny, was real, global, and warmer than the present. Editorial, page 3. All the facts and data that expose the climate scare - in one place. Marc Sheppard’s remarkable report from the Third Heartland International Climate Conference, in Washington DC, is the best eight-page summary of the current state of the science and politics of “global warming” that you’ll find anywhere. Pages 4-11. The IPCC assumes CO2 concentration will reach 836 ppmv by 2100, but, for seven years, CO2 concentration has headed straight for only 575 ppmv by 2100. This alone halves all of the IPCC’s temperature projections. Pages 12-13. 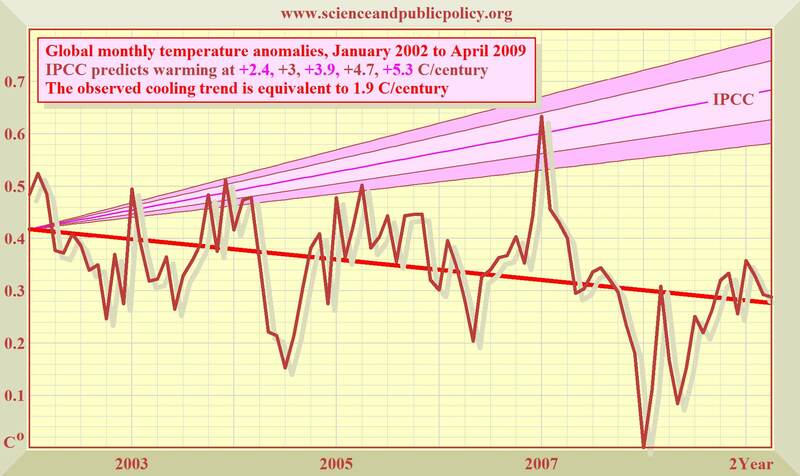 Since 1980 temperature has risen at only 2.5F (1.5C)/century, not the 7 F (3.9 C) the IPCC imagines. Cooling for the past 8 1/2 years has been at a rate of 3.4F (1.9C) per century. Pages 14-15. Sea level rose just 8 inches in the 20th century and has been rising at just 1 ft/century since 1993. Though James Hansen of NASA says sea level will rise 246 feet, sea level has scarcely risen since the beginning of 2006. Page 16. Arctic sea-ice extent is about the same as it has been at this time of year in the past decade. In the Antarctic, sea ice extent - on a 30-year rising trend - reached a record high in 2007. Global sea ice extent shows little trend for 30 years. Pages 17-19. The Accumulated Cyclone Energy Index is a 2-year running monthly sum of activity in all hurricanes, typhoons and tropical cyclones. It shows that there is now less severe tropical-storm activity than for 30 years. Page 20. Solar activity at last shows signs of recovery. Will global cooling be replaced by global warming? Page 22. The (very few) benefits and the (very large) costs of the Waxman/Markey Bill are illustrated at Pages 23-24. Science Focus this month studies painting the world white to Save The Planet - another dumb idea. Page 25. Finally, there’s our “global warming” ready reckoner, and our monthly selection of scientific papers. Pages 26-29. See full report here.